Some things in life are quite simple. Their simplicity can range from the self-evident to the easily explainable, but the beauty of these simple things is that their simplicity does not take anything away from their sophistication or even complexity. Let’s take the address of this site, www.arabdemocracy.com, as an example. The parts (www) and (.com) immediately tell you that I am pointing you to a space on the ‘world wide web’ and that this space or is part of some sort of a non-profit public interest type concept. Simple! Now, the word democracy is also fairly simple. Of course it refers to a very complex concept, but that does not take away from its simplicity. We would all immediately understand that we are talking about a specific political system of government. Furthermore, none of us would really have much trouble recognizing, for instance, that most European countries are democracies and that most Arab countries are not. Simple! Finally, that leaves the word Arab. Arab, which despite referring- like any other identity label- to a very complex set of cultural, historical, geographical and political realities, nonetheless is an easily recognizable term. We can all agree that an Arab is someone who hails from one of the twenty one countries that make the Arab world, who speaks Arabic and who considers themselves a product of a largely Arabic-speaking cultural heritage. We would all realize that this is a blanket operating definition and that there are numerous exceptions to it and nuances within it. Yet, we would not have difficulty reaching consensus around it, such that we can agree to call someone an Arab. Quite simple really. Being a Lebanese leftist is an equally simple thing! Yes, yes…I know. There are many lefts and various forms of each and…and…and…but its still simple. Here’s the deal: if you are a leftist-or at least if you became a leftist anytime after the late 1800’s- then there are three basic principles you adhere to and they define you as a leftist. You don’t just wake up one day and decide you’re a leftist because you wore a red T-shirt with Che’s picture on it. You also don’t get to deviate fundamentally from these principles and retain your exclusive rights to being a Lebanese, or Arab, leftist. You would display more moral courage to simply do the democratic thing and accept that you are not a leftist anymore!! So what are these three principles? Well, they’re simple really. First, a Lebanese leftist, like any other leftist, is a historical materialist. This means she believes that history is driven by forces defined chiefly- but not exclusively- by the interaction of the different socio-economic classes of society, and the logic of the distribution of economic power among them. In this context, a Leftist has very few illusions about what she means when she speaks about equality and social justice. Second, a Lebanese leftist is a staunch secularist and a sworn enemy of sectarianism. She does not accept that a sectarian political structure is a necessary evil because “that’s how we Lebanese are” or because “we first have to convert all Lebanese to secularism before we dismantle the sectarian institutions”. This is a deceptive and pathetic excuse. A leftist would generally be intelligent enough to realize that, in fact, it works precisely the other way round! You dismantle the institutions that rob humans of their rights as individual citizens, in order to break the vicious cycle that binds them, like slaves, to the sectarian chieftains. As such a Lebanese leftist knows that she has no business being in an alliance of sectarian factions, regardless of which day in the month of March they happen to prefer! Third, a leftist, in a Lebanese context, has very little confusion about her position on the Arab-Israeli conflict. She has a very clear idea of the history of Israeli aggression against her country and the countries of fellow Arabs. Yet her opposition to Israel is deeper than that still. She understands that this struggle is not simply about one army occupying the country of another. It is also not about the conflict of two ethnic groups or an eternal enmity between two mythologies. Rather, she knows fully well that Israel is an apartheid state and an entity built upon a mixture of self-styled ethnic and religious exclusionary racism, and by a continuing process of genocide and ethnic cleansing. The bottom line is this: if you decide that a liberal free market economy is “cool”; that secularism is just one option in a multiple choice sectarian question; that a brutal oligarchy you- rightly- bitterly oppose is a greater threat than an enemy whose openly advertised goal is the obliteration of your identity and the destruction of your possible future, then you are not a leftist. Period. Obviously, you are free to make this choice. Who knows, you might even be right… but you’re certainly not left. Interesting how a democratic leftist can be so sure of the "really...simple" way forward. Amazing how debate and different approaches can be redcued to one person's view of what is 'right' and what is 'wrong'. The tone and presentation does not even encourage to engage in debate with a self-styled righteous method of defining a broad political position. Not to mention it is naive and simplistic rather than being of any value in producing a political analysis. This I believe is an undemocratic, non-realistic, self-styled imposition on the realities of life to achieve a certain level of mental relaxation that eases the challenge of actually trying to answer the necessary questions for the left to move forward. Thx Bassem for your nice article that I truly think reached its aim adding something new to the debate by trying to simplify certain important issues and highlight them as “boxes to be ticked”. Even if I do not totally agree with the classification of criteria you made, I do believe it’s the right way forward to look for the real questions any leftist in the 21st century should challenge himself with. In my view, the reality is more sophisticated and complicated when it comes to taking position regarding the Lebanese sectarian system and the Lebanese economical and social system (if there is one): overthrow it or work within in order to achieve structural reforms. I think both can lead to a real positive change if operated with transparency and rigor. This article reminded me of the position of Kamal Jumblatt towards Fouad Chehab’s economical and social reforms. What he said was: “Chehab felt the impossibility to overthrow the sectarian system, but he succeeded in creating national civil institutions for the sectarian Lebanese societes, and gathered them under a reformed platform”. Unfortunately this failed again for the reasons we all know, reasons that were partly responsible of triggering the war because of the sectarian system once again (the Christian refusing to share the power)… But the try of overthrowing the system was as well a war that lasted for 15 years. 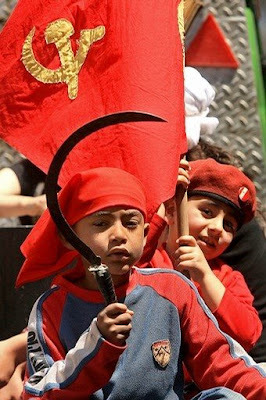 However, The problem within the Lebanese left now is double: The Lebanese Communist party passed the boundary of the religious right considering Hezbollah as a progressist entity just because it resists, and the Democratic Left Movement crossed the boundary of the Right the other way marrying very well and in a very hawkish way the positions of the American neocons just because they’re anti Syrian, that’s why Democratic left is now in a total identity crisis. Unfortunately, political sciences do not classify a party direction according to its founding declaration but according to their political positions and policies. So objectively and scientifically, Democratic left is on the Right. The real issue is as well in the timing: While it’s now very convenient for the left in Lebanon to work creatively on its leftist ideas and try to mobilize for them a year ahead of general elections, and because the political vacuum the country is experiencing allows parties to work on their internal issues (the Lebanese forces are working seriously on that), the two main “Left” formations we have are unfortunately struggling to marry their leftist labels with their rightist policies. I think that in many ways THE LEFT is a relative term and can only be defined in relation to a RIGHT. And these parameters are variable depending on the context. Looking at it from this perspective both Bassem and Marc are to the left of someting. On the other hand that could mean that George Bush is to the LEFT of Gengis Khan and Adolf Hitler. My question to all is why is the label of 'leftist' still attractive to many who despise many of its social , economical and ideological values? Thank you for your interest in the article and for taking the time to comment on it. I have basically two main points to highlight. 1- I think there is some confusion regarding the difference between an opinion piece- an editorial- and a article of critical analysis. This is an example of the former. Which explains the tone and the simplification. For those interested in reading more in depth critical analyses on the same subject, I refer you to the article titled "The Mule" posted on this very same site and to an article titled "The death of Lebanon or the rise of the left" published in Al-Adab magazine on 02/02/2008. 2- Having said this, I do strongly believe that the three basic principles I outlined are a key part of any useful definition of the Left in Lebanon today. Thus, I do not agree that the term "Left" is a free for all because it has very specific ideological foundations. These foundations are flexible, debatable and changeable of course, but only as long as the basic framework is sustained. Otherwise, as I point out, it is no longer left. Hence, it is not undemocratic to say that if you oppose the basic (and, yes, simple) principles of socialist thought, you are not really a leftist in any useful sense of the word. Therefore, it follows that it is quite inaccurate to say that the left is only defined in terms of a "right". Because the left has its own vision and general idea of what constitutes a just society etc... Thus, George being to the left of Adolf (is he really?) does not make him a LEFTIST. Surely, we can all agree on that simple fact, no?